Three years after the Mighty Five® Tour brought the Utah Symphony to the state’s five national parks, the symphony is embarking on another tour, this time with performances in rural communities in or near state parks and national monuments throughout Utah. On Thursday, August 31st, Bluff, UT will host a performance of the ‘Great American Road Trip’ tour with conductor Thierry Fischer leading the orchestra. 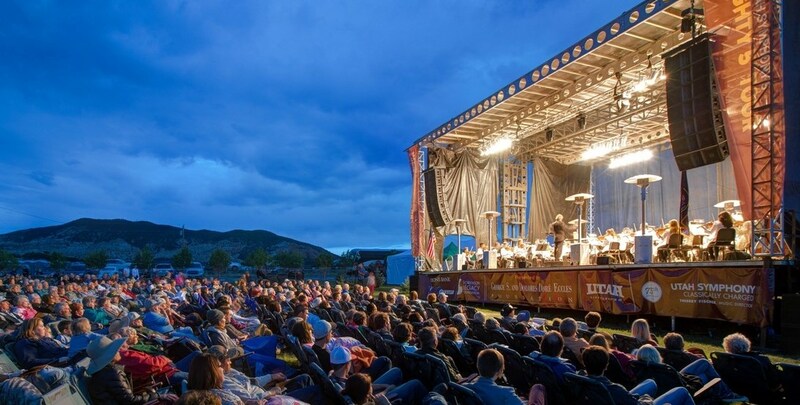 Pairing live, classical music with the natural landscapes of southeast Utah, this free outdoor concert will feature the full Utah Symphony, as well as opera singers from the Utah Opera, and music by Native American composer/musician Brent Michael Davids. Two works by Davids will be featured in the concert including his original piece, ‘Fluting Around’, which Davids will play on a traditional Native American wooden flute. Utah Opera’s resident artist soprano, Abigail Rethwisch, will sing Davids’ ‘Spirit Woman Song’, and will join her husband, baritone Andrew Paulson in operatic and musical theater selections. Based on availability, walk-up tickets may be available the night of the performance, but are not guaranteed. The Bluff performance will be held at 8:00pm at Camp Stickie-ta-tudy located just off Hwy 163, 2.3 miles west of the Bluff Post Office. This entry was posted in Bluff, Events, Things to do for FREE!, Things to do with kids, Travel, Utah and tagged Bluff, Events, Things to do for FREE!, Things to do with kids, Travel, Utah. Bookmark the permalink.